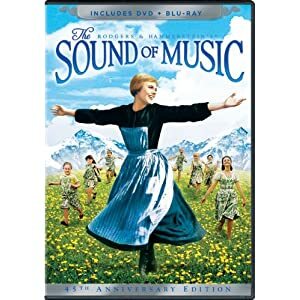 The Sound of Music 45th Anniversary Collection was released for the first time on Blu-ray on November 2nd. I received the Blu-ray and DVD combo pack that included lots of special features. Not having a Blu-ray player myself, I cannot vouch for the play quality of that aspect. Everyone in my family, minus the husband, has always enjoyed watching The Sound of Music and was excited to add it to our DVD collection. It is a classic that makes you feel good and leaves unforgettable songs in your head. My oldest girl is such a fan of this movie that a couple of years ago she sang a song from this classic film in the talent portion of a beauty pageant. The special features from the 3-Disc Set would make a nice holiday gift for someone who is a fan of the original. The features bring the movie closer to home and give a more personal viewing experience. Actually, I didn't realize but this is one of my father's favorite movies-Go figure!